Turkey is such a strange icon for Thanksgiving. Even in a culture where meat comes before potatoes in an aphorism, turkey is not the thing that excites people about the Thanksgiving meal. Pie, stuffing and sides take home the medals in creating Thanksgiving food memories. I could have a plate of stuffing and the best Thanksgiving side, mashed potatoes; possibly with gravy and call it a successful holiday meal. Actually, I could have a big plate of mashed potatoes and call it a successful meal. Usually, Halloween is the time for frightening stories, but I have a scary Thanksgiving tale: One Thanksgiving, many years ago, in a place not to far from here, someone brought mashed potatoes to a holiday potluck. Red potatoes, lumpy, red potatoes. And I knew the potatoes were red because the skin was left on as if they were for dinner on some random Tuesday in February instead of the biggest feast day of the year. The memory haunts me. More nightmarish; word is some people don’t eat potatoes, because carbs. Besides parsnips, I’ve heard tale of adding celeriac to mashed potatoes. Or bacon fat. Braised kale. Cream. Pesto, not Thanksgivingy, but it sounds intriguing. Broccoli. Rosemary; I could see how that could be done right. Sour Cream, okay that’s pretty genius, MacArthur level of genius. Buttermilk. Mashed Cauliflower. Yogurt. 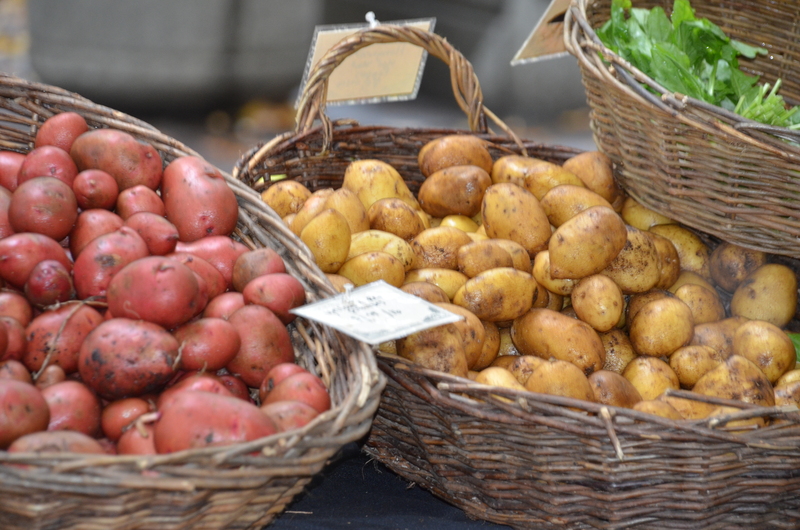 Calling for specific potato varieties. Cheddar. Mayonnaise, really mayonnaise, wow. Peeled. Skin on. Start the potatoes in water cold. Bring the water to a boil before adding the potatoes. The level of specificity on how Thanksgiving potatoes ought to be prepared is amazing and I’m the worst, most recalcitrant cook on this issue. The three keys to successfully mashing potatoes: Yukon golds. Vegetable stock*. Ricing. Pick a golden skin variety like Yukon Gold. Peel, cut in two-ish inch pieces, place in cold water, bring to a boil, reduce heat. They’re done when they can be pierced with a knife, this should happen after 20 minutes. Drain. Rice. A potato ricer is an advanced engineering instrument, one so awesome it’s like the hand powered machine is from the future; A ricer not only allows the user to employ rice as a verb, properly. It helps one rice potatoes, quickly, converting potatoes into equal sized rice shaped granules. No need to whip, beat, mash, it’s done, just add vegetable stock, which will round out the potato’s earthy tones. Mix until desired consistency. To help one verb rice, not noun rice. Butter, salt, pepper. Elegant, straight-forward, feast-worthy. Even though having strong opinions is fun, and food is safer topic to have strong opinions about this time as opposed to things with a political bent, there’s no wrong way to mash potatoes, just what’s right for you. * Vegetable stock – certainly not from a carton, it’s better to use milk or cream than open a carton in this situation. Add two diced onions, two thinly sliced carrots, 3 ribs of celery, dried mushrooms to a 4qt pan with a healthy pinch of salt, and by healthy I mean generous, not like blood pressure healthy. Sauté until onions begin to brown. Cover 8-10 cups water, bring to a boil, reduced heat to a simmer, cook for 30 minutes. Remove from heat, add fresh parsley and thyme, cover for an additional 30 minutes, strain.